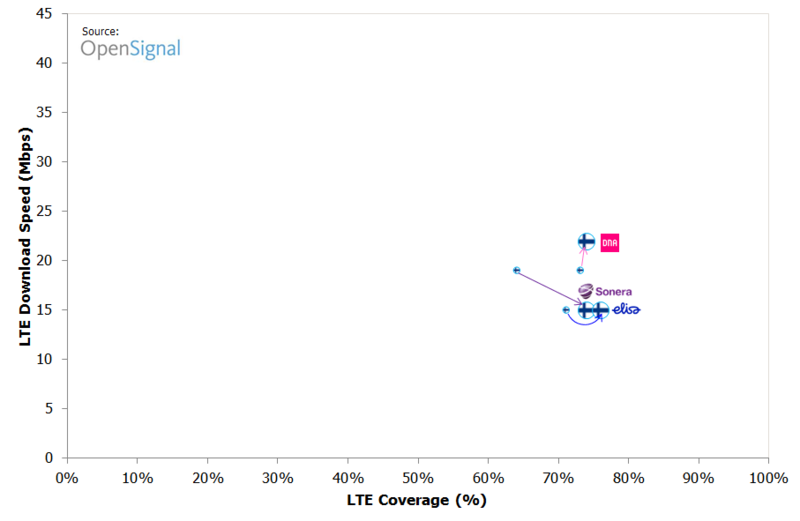 The mobile network performance crowdsourcer OpenSignal published its latest State of LTE report today. This time it’s based on data samples from 357924 mobile users who have OpenSignal’s app on their Android devices. The network performance data isn’t just gathered when users actively do a measurement; it’s collected all the time and the number of samples are therefore hundreds of millions. The stats thus better represent the normal behavioural patterns of users when it comes to time and location. The data is collected during the fourth quarter of 2015. We have previously touched upon the differences between the actual user experience – which OpenSignal emulates – and the population coverage on 4G LTE marketed by operators. We concluded that all Nordic operators overstate their coverage. It might not be in conflict with operators’ technical definition – but in conflict with the customer expectation of what it means. In the picture below – from OpenSignal’s report page – we have highlighted the positions of the operators in Denmark, Finland, Norway and Sweden (click to enlarge). The vertical axis shows the measured average LTE download speed in Mbit/s whereas the horisontal axis shows the LTE coverage (in % of time). Operators in the upper right corner are leaders while operators in the lower left corner are laggards. 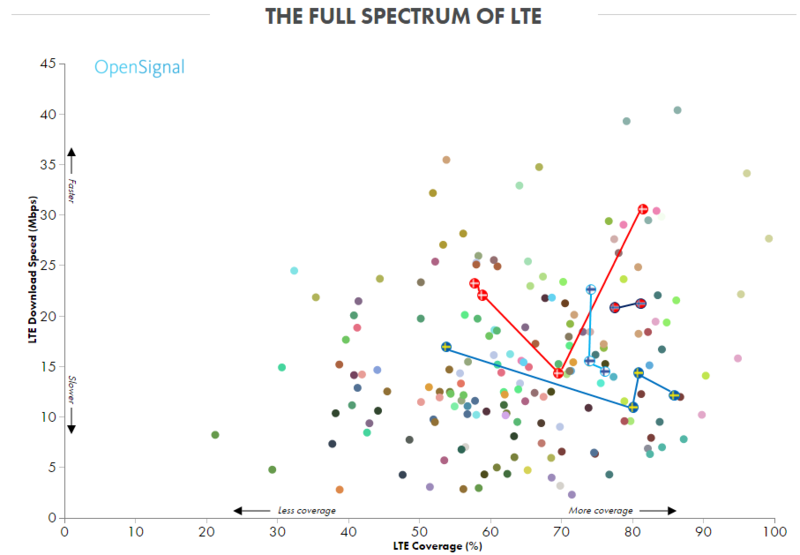 A quick visual check suggests that the leadership of Nordic operators in 4G LTE speed and coverage isn’t as obvious as it once used to be. Nordic operators haven’t deteriorated – it’s instead the operators in the rest of the world that are catching up. We will now look into each of the Nordic markets one by one. TDC’s network is also having the widest coverage – OpenSignal’s app users are covered by 4G LTE 82% of the time. It’s high, but still below the 99.5% population coverage (outdoors) that TDC communicates. 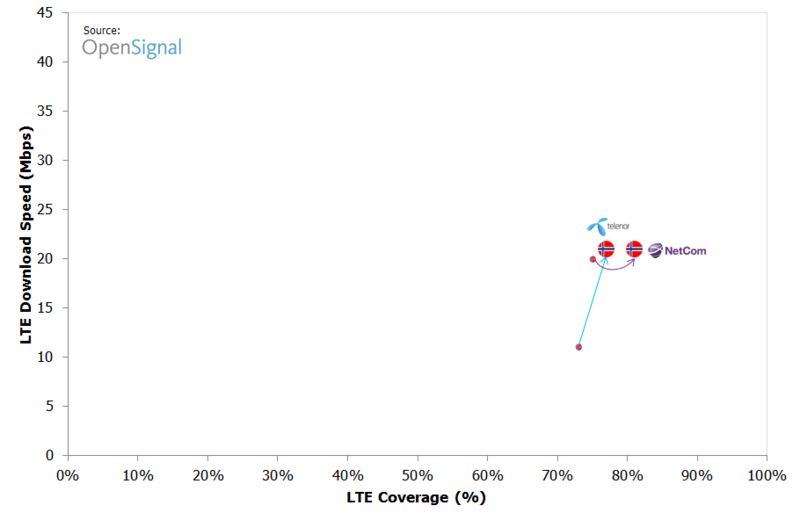 The arrows show the development in OpenSignal data between Q3 2015 and Q4 2015. TDC’s and 3’s trends are towards lower speed which usually happens with higher traffic load due to increased 4G penetration. At the same time, though, TDC and 3 have expanded their coverage. The Swedish operators were among the first in the world to communicate 99% population coverage figures for 4G. 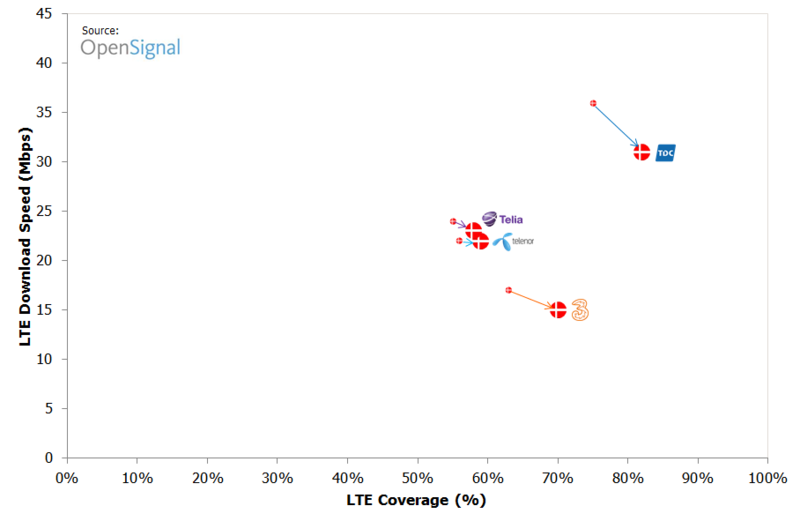 The graph shows that two of the Swedish 4G LTE networks, Tele2 & Telenor‘s shared network and Telia, have 78-85% coverage which indeed is high. 3 is much behind, but the speed (where 3’s 4G network covers) is a bit higher than with the other two networks. In this context, we should remember that the quality of the 3G network still is important for the overall customer experience of mobile data. 3 Sweden continues to have very high average data usage levels suggesting a capable 3G network. 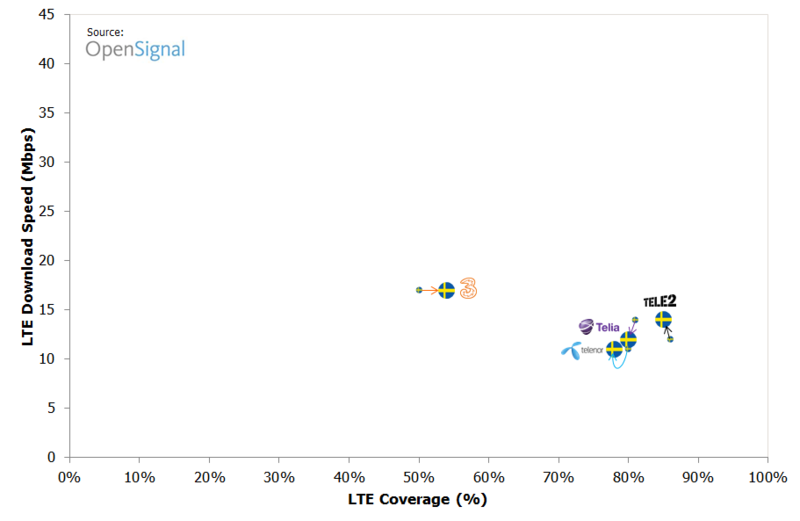 Finnish 4G networks are slightly faster than Swedish networks but have slightly less coverage. In its marketing, Elisa states 98% population coverage. Sonera is more modest with 95% – while DNA’s “almost 95%” is most modest. The crowdsourced reality is different: When it comes to 4G coverage in Finland, the operator doesn’t matter. Coverage levels for all three are in the 74-76% range. Sonera has during Q4 improved its coverage significantly even though speed has decreased somewhat. DNA continues to have Finland’s fastest 4G network. Sonera and DNA have started to share networks in the North of Finland in 2015 and will expand it further to Eastern Finland this year. Telenor in Norway shows the single biggest shift from Q3 to Q4: Suddenly the speed of Telenor’s 4G network doubled to be on par with NetCom’s. We have been critical to Telenor Norway’s way to monetise mobile data on volume, on speed tiers and on policy at the same time. Even though Telenor’s plan setup still feature all of this, the question is if Telenor in practice have stopped throttling customers? Or has the company lately been very successful in up-selling unthrottled speeds? In fairness, NetCom’s plan setup follows the same logic as Telenor – but previous OpenSignal stats never showed low average speeds. NetCom‘s 4G network is as fast as Telenor’s but provide a better coverage (81% vs. 77%). So, which Nordic operator has the best 4G network? There’s no obvious winner but based on OpenSignal’s data TDC, Tele2/Telenor Sweden, Telia Sweden, DNA and NetCom clutter around the podium. A possible comfort for the rest: The 3G network quality is still important for the customer experience – even for customers with 4G subscriptions on 4G devices.